The Florida Keys is the ideal destination for the flats fishing enthusiast, providing anglers with fishing access to many of the species found in more remote parts of the world without giving up the comforts of home. Tarpon, permit, bonefish, snook, and redfish are all within easy reach! It's hard to beat the Florida Keys for good weather year round. It's one of the reasons we live here, and one of the reasons so many come to visit. That said, certain times of year are better than others for particular species. If you have something specific in mind for your trip please contact us by either email or telephone to discuss it. Here are some general suggestions for your best time to visit . . .
Tarpon are a residential fish with a population that live in the Keys and Everglades all year long. 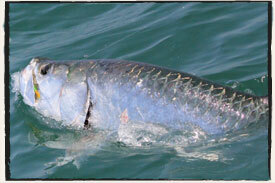 Tarpon fishing during January-March can be off the charts, depending on conditions and is not a 'sure thing.' Migratory tarpon can show up as early as late February or as late as May depending on weather conditions and water temperatures. While some believe you can only fish for the Silver King from April through June, there is much less pressure through the summer and fall when some of the best tarpon fishing can take place. Living legend Capt. Steve Huff described tarpon best; "If you were to sit down and design a fish, and write all the best factors of a fish on paper, I think you would come up with a tarpon." Permit inhabit wrecks and reefs in the Gulf of Mexico and the Atlantic year-round. Sightfishing on the flats for permit is best when water temperatures are above 75 degrees Fahrenheit. 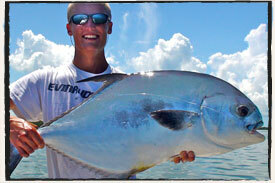 The best months for finding permit on the flats are February-April, and June through October. During the middle of April and May they evade the flats to spawn on the wrecks and reefs in the Gulf of Mexico and the Atlantic Ocean. Moderate to windy days are much better for consistently hooking permit, when they are less wary and don't always require that perfect presentation. 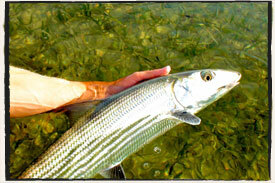 Bonefish: live in the Keys year-round and range from the Miami skyline to the Marquesas west of Key West. They can be found on the flats when water temperatures are above 72 degrees Fahrenheit and below 90. During summer they require deeper and cooler water during the hottest part of the day, however, in the spring and fall they may stay on the flats all day. Sometimes scarce during the spawn--a conditional thing (tide, moon, water temp) and hard to predict--and during cold fronts. 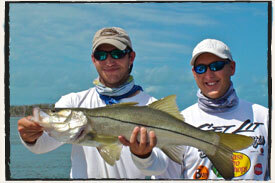 Snook & Redfish are a staple of backcountry fishing and can be found all year. Sight fishing for snook on the flats either using a fly rod or artificial lures is best when water temperatures are between 70 and 85 degrees Fahrenheit. Redfish are not as temperature sensitive and will remain on the flats even when water temperatures exceed 85 degrees Fahrenheit.